For my turntable drawing machine I’ll need the platter to spin. In a “real” turntable (the kind used for vinyl albums) there are three methods, idler-wheel, direct drive, and belt-drive. 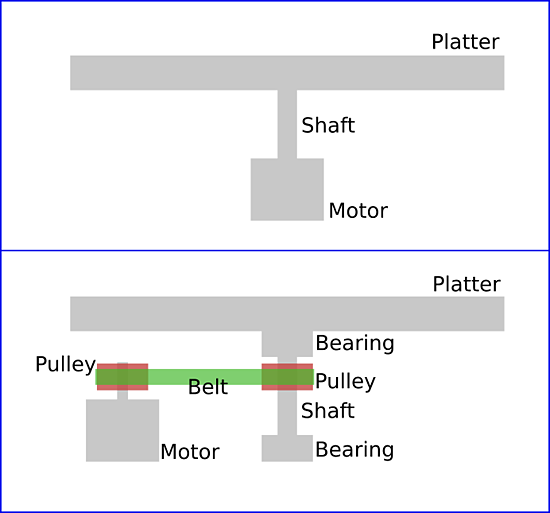 The illustration above shows my original idea for direct-drive, which I quickly abandoned in favor of belt-drive, on the bottom. Frankie gave me a crash course in the metal lathe. (I last use a lathe back in the 1980s, and it was a wood lathe!) I learned how to face off the material, and then he showed me how to narrow it down to size. 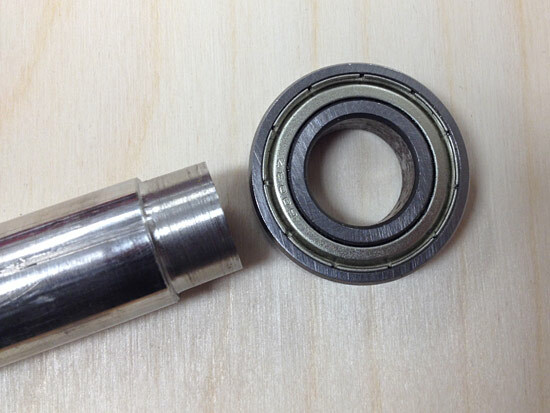 We got it to a perfect fit for the bearing! 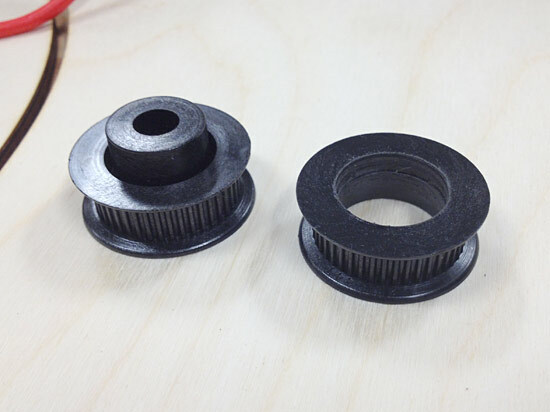 I also had some plastic pulleys on hand from when MakerBot sold off all their old Cupcake CNC parts… I knew they’d come in handy someday! We managed to drill out the center on the lathe so it fits tight over the steel shaft. I may need to add a set screw or some locking collars, but it’s a nice tight fit right now. 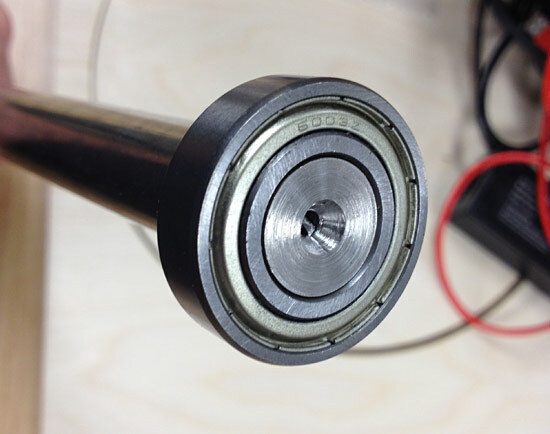 Here’s the shaft, bearing, and pulley all properly sized. Once I determine the length of the shaft we’ll put it on the lathe, cut it down, and then get the other side to the right size. 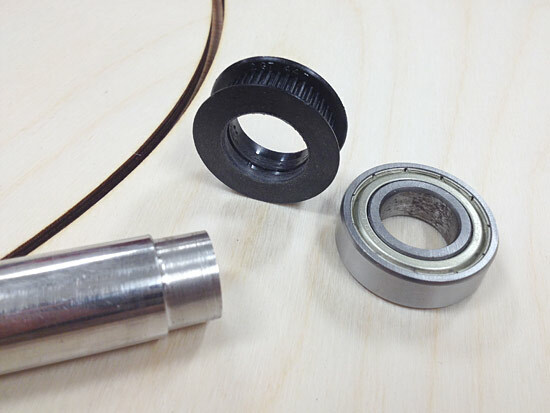 I’ll make some pieces that hold the bearings by either laser cutting some material, or 3D printing something, or maybe via the CNC router. Posted on Monday, April 13th, 2015 at 10:23 pm. Subscribe to the comments feed. Both comments and pings are currently closed. Post on your own blog.